Mowgli’s wise and intelligent guardian, Bagheera, represents all the best traits of cats. Most widely recognisable from Disney’s 1967 animated version and recently re-imagined as CGI in the 2016 live action remake, Bagheera was voiced by Sebastian Cabot and Ben Kingsley respectively. Acting as guide and protector for Mowgli, the infant human child he rescues and helps raise, Bagheera decides that Mowgli is grown enough to return to live with humans, arguing that the forest is not a place for human children and that Mowgli will be better off among his own kind. However, the young Mowgli refuses to listen despite the growing danger he puts himself in by choosing to stay. The Disney classic has captured the hearts of audiences the world over, and Bagheera has served as a guide and protector for not only Mowgli, but the young audiences who fell in love with the film. Originating from a 1970s American comic strip, Garfield has become a well-known cultural icon. 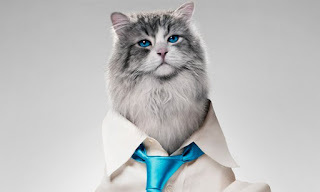 Notorious for being a lazy, coffee-drinking, well-fed house cat who hates Mondays, he made his silver screen debut in the 2004 CGI adventure Garfield: The Movie. The film adapts many of the comic strip characters and follows Garfield as he struggles to adjust to new houseguest and stray dog, Odie, whom he cannot stand. When Odie gains fame at a dog-show competition, Garfield reacts out of jealousy and locks Odie out of the house causing him to run away. But when Garfield discovers Odie has been kidnapped, he puts aside his dislike for the dog and sets out on a rescue mission. The well-loved and widely syndicated comic strip is still running today.